Melbourne’s iconic Princess Theatre is regarded by many as Melbourne’s most spectacular landmark. Dating back as far as 1854, the theatre was purchased by Marriner Theatres in 1986 and plans were put in place for its total refurbishment and to ensure its future viability as a live theatre venue. The Princess Theatre reopened in 1989 with the musical ‘Les Miserables’ followed by ‘The Phantom of the Opera’ which established a new record for the longest-running show ever staged in Victoria. The theatre can currently hold up to 1500 patrons over its three levels; Stalls, Dress Circle and Grand Circle. The original chandelier and many of the building’s bespoke interior features are still in place. Other world-class stage productions to have played at this theatre include Cats, Mamma Mia!, The Producers, Dirty Dancing, Jersey Boys, South Pacific, Hairspray, MATILDA The Musical and ONCE. 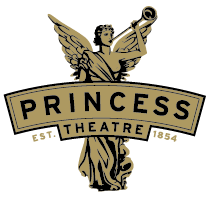 The Princess Theatre Box Office opening hours are Monday-Friday 9am-5pm and also 2 hours prior to all performances. *Please Note: 90 minutes before each performance the Box Office is only open to those patrons attending the current show. *Please Note: If you have selected venue collect for your tickets to Harry Potter and the Cursed Child Parts One and Two, they are only available for collection on the day of performance and exclusively from the Princess Theatre. VIP Red Carpet ticket holders can pick up tickets and vouchers from 1 hour pre-show on the day of the event at the VIP section of the main bar in the Stalls foyer, downstairs at the Princess Theatre. Please note, only tickets purchased from our official ticketing partner; Ticketmaster, are valid for shows at Marriner Group venues. Tickets purchased through any other sources may not be valid and you may not be admitted into the show. The Princess Theatre is situated in the Melbourne CBD and is accessible by all modes of transport. There are several theatre entrances located on Spring Street. Glass doors are kept open prior to and during performances. There is one step up into each doorway. A ramp is positioned at the door two hours before performance time. The foyer is a tiled area. All counters in the foyer area are high. There is a slight rise into the auditorium before the tiled surface gives way to carpet. The box office is located in the foyer. There are no steps from the foyer into the Stalls area of the auditorium. Seating has no central aisles. Seats fold down and forward leaving more room between rows when seats are unoccupied; some people however, may need to brace themselves against the armrest. From the last four or five rows (T-W), view of the stage, above actor’s head height, is affected by the Dress Circle overhang. Steps up to the Dress Circle are marble, and the railing is high and thick. There are numerous steps with railing up to the Grand Circle. Keep in mind that the Grand Circle is a long way up and that seating rows are steeply tiered. There are no rails down the internal aisles and the aisles’ steps are irregular. The side aisles have rails. There are eight steps, with rails, down to the female toilets in the street level Stalls foyer. Male toilets at this level have no steps. There are no steps leading to the male toilets in the Dress Circle Foyer. Female toilets on this level have two steps with no handrail. To access the Grand Circle toilets, it is necessary to go down a flight of steps and then a further five steps, all with rails. There is a unisex accessible toilet located between the Male and Female toilets at the Little Bourke Street end of the lower foyer. There is a clearly visible sign. It is recommended to request Stalls seating. Grand Circle not suitable for elderly/disabled or patrons who suffer Vertigo. Frames and crutches are stored in either the recesses in front and back of Stalls, or in the Front of House Manager’s office and returned at interval and conclusion of performances. Patrons are advised of storage area and all items are marked with the patron’s row and seat number. There is a hearing loop within the Princess Theatre. Either headsets or a neck loops (for those with a T-switch) can be obtained from the cloak room. Please proceed to the cloak room or see a member of our Front of House team on arrival at the venue. You can contact the Princess Theatre Box Office for more information on (03) 9299 9800. Cushions: For children attending a show at the Princess Theatre. there are a limited amount of cushions available in the Stalls area only. There are no cushions available for seats in the Dress or Grand Circle as the seating is raked. If you would like assistance with choosing your seating locations please contact the Box Office. Alcohol, hot drinks, cans, bottles, recording equipment can not be brought onto the premises. The Princess Theatre is a no smoking venue. There are no ATM’s on the premises. Closest ATM is on the corner of Little Bourke and Exhibition Street. There is a cloakroom available in the downstairs foyer. Please see an usher on entry to the theatre. The theatre provides this service complimentary. The Princess Theatre is a fully seated venue over three levels.